The ARM I building at Peterhouse Technology Park, Cambridge. The building is a work by architects Barber – Casanovas – Ruffles. ARM Holdings plc (ARM) is a multinational semiconductor and software design company, owned by SoftBank Group. 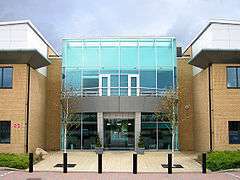 Headquartered in Cambridge, United Kingdom, its primary business is in the design of ARM processors (CPUs), although it also designs software development tools under the DS-5, RealView and Keil brands, as well as systems and platforms, system-on-a-chip (SoC) infrastructure and software. It is considered to be market dominant for processors in mobile phones (smartphones or otherwise) and tablet computers. The company is one of the best-known 'Silicon Fen' companies. Processors based on designs licensed from ARM, or designed by licensees of one of the ARM instruction set architectures, are used in all classes of computing devices. Examples include microcontrollers in embedded systems – including real-time safety systems (cars' ABS), smart TVs (Google TV), all modern smartwatches (such as Qualcomm Toq), as well as smartphones, tablets, laptops, desktops, servers and supercomputers/HPC. ARM's Mali line of graphics processing units (GPU) are used in laptops, in over 50% of Android tablets by market share, and some versions of Samsung's smartphones and smartwatches (Samsung Galaxy Gear). It is third most popular in mobile devices. Systems, including iPhone smartphones, frequently include many chips, from many different providers, that include one or more licensed ARM cores, in addition to those in the main ARM-based processor. ARM's core designs are also used in chips that support many common network related technologies in smartphones: Bluetooth, WiFi and broadband, in addition to corresponding equipment such as Bluetooth headsets, 802.11ac routers, and network provider's cellular LTE. ARM's main CPU competitors include Intel and AMD for servers,. In mobile applications, Intel's Atom is a competitor, as well as with x86 chips. AMD also sells ARM based chips as well as x86; Imagination Technologies (MIPS) offers another RISC design for embedded systems. ARM's main GPU competitors include mobile GPUs from Imagination Technologies (PowerVR), Qualcomm (Adreno) and increasingly Nvidia and Intel. Despite competing within GPUs, Qualcomm and Nvidia have combined their GPUs with an ARM licensed CPU. ARM had a primary listing on the London Stock Exchange and was a constituent of the FTSE 100 Index. It has a secondary listing on NASDAQ. However Japanese telecommunications company SoftBank Group made an agreed offer for ARM on 18 July 2016, subject to approval by ARM's shareholders, valuing the company at £23.4 billion. The transaction was completed on 5 September 2016. The acronym ARM was first used in 1983 and originally stood for "Acorn RISC Machine". Acorn Computers first RISC processor was used in the original Acorn Archimedes and was one of the first RISC processors used in small computers. However, when the company was incorporated in 1990, the acronym was changed to "Advanced RISC Machines", in light of the company's name "Advanced RISC Machines Ltd." At the time of the IPO in 1998, the company name was changed to "ARM Holdings", often just called ARM like the processors. The company was founded in November 1990 as Advanced RISC Machines Ltd and structured as a joint venture between Acorn Computers, Apple Computer (now Apple Inc.) and VLSI Technology. The new company intended to further the development of the Acorn RISC Machine processor, which was originally used in the Acorn Archimedes and had been selected by Apple for their Newton project. Its first profitable year was 1993. The company's Silicon Valley and Tokyo offices were opened in 1994. ARM invested in Palmchip Corporation in 1997 to provide system on chip platforms and to enter into the disk drive market. In 1998 the Company changed its name from Advanced RISC Machines Ltd to ARM Ltd. The Company was first listed on the London Stock Exchange and NASDAQ in 1998 and by February 1999, Apple's shareholding had fallen to 14.8%. In 2010, ARM joined with IBM, Texas Instruments, Samsung, ST-Ericsson and Freescale Semiconductor (now NXP Semiconductors) in forming a non-profit open source engineering company, Linaro. Japanese telecommunications company SoftBank Group made an agreed offer for ARM on 18 July 2016, subject to approval by ARM's shareholders, valuing the company at £23.4 billion. The transaction was completed on 5 September 2016. Unlike most traditional microprocessor suppliers, such as Intel, Freescale (the former semiconductor division of Motorola, now NXP Semiconductors) and Renesas (a former joint venture between Hitachi and Mitsubishi Electric), ARM only creates and licenses its technology as intellectual property (IP), rather than manufacturing and selling its own physical CPUs, GPUs, SoCs or microcontrollers. This model is similar to fellow British design houses: ARC International, and Imagination Technologies who have similarly been designing and licensing GPUs, CPUs, and SoCs, along with supplying tooling and various design and support services to their licensees. The company has offices and design centres across the world, including San Jose, California, Austin, Texas, Chandler, Arizona and Olympia, Washington in the United States; Bangalore and Noida in India; Trondheim in Norway; Lund in Sweden; Sophia Antipolis in France; Munich in Germany; Yokohama in Japan; China, Taiwan, Slovenia and Hungary. An ARM processor in a Hewlett-Packard PSC-1315 printer. A characteristic feature of ARM processors is their low electric power consumption, which makes them particularly suitable for use in portable devices. In fact, almost all modern mobile phones and personal digital assistants contain ARM CPUs, making them the most widely used 32-bit microprocessor family in the world. As of 2005, ARMs accounted for over 75% of all 32-bit embedded CPUs. ARM processors are used as the main CPU for most mobile phones, including those manufactured by Apple, HTC, Nokia, Sony Ericsson and Samsung; many PDAs and handhelds, like the Apple iPod and iPad, Game Boy Advance and Nintendo DS, Game Park GP32 and GamePark Holdings GP2X; as well as many other applications, including GPS navigation devices, digital cameras, digital televisions, network devices and storage. The WLAN processor of Sony's PlayStation Portable is an older ARM9. Cores for 32-bit architectures include Cortex-A32, Cortex-A15, Cortex-A12, Cortex-A17, Cortex-A9, Cortex-A8, Cortex-A7 and Cortex-A5, and older "Classic ARM Processors", as well as variant architectures for microcontrollers that include these cores: ARM Cortex-R7, ARM Cortex-R5, ARM Cortex-R4, ARM Cortex-M4, ARM Cortex-M3, ARM Cortex-M1, ARM Cortex-M0+, and ARM Cortex-M0 for licensing; the three most popular licensing models are the "Perpetual (Implementation) License", "Term License" and "Per Use License". Processors believed to be designed independently from ARM include Apple's (architecture license from March 2008) A6, A6X, A7 and all subsequent Apple processors (used in iPhone 5, iPad and iPhone 5S), Qualcomm's Snapdragon series (used in smartphones such as the US version of the Samsung Galaxy S4) and Samsung's Exynos ("Mongoose" M1 cores). There were around 15 architectural licensees in 2013, including Marvell, Apple, Qualcomm, Broadcom and some others. Companies with a 64-bit ARMv8-A architectural license include Applied Micro, Broadcom, Cavium, Huawei, Nvidia, AMD, Samsung, and Apple. Fujitsu (a supercomputer maker of June 2011 worlds fastest K computer according to TOP500) announced at the International Supercomputing Conference in June 2016 that its future exascale supercomputer will feature processors of its own design that implement the ARMv8 architecture. These processors will also implement extensions to the ARMv8 architecture equivalent to HPC-ACE2 that Fujitsu is developing with ARM Holdings. ARM-based CPU market share in 2010: over 95% in smartphone market; 10% in mobile computers; 35% in digital TVs and set-top boxes; however, ARM did not have any market share in servers and desktop PCs. As of 2014, over 50 billion chips with ARM cores inside have been produced, 10 billion of which were produced in 2013,. With Microsoft's ARM-based Windows 8 OS, market research firm IHS predicted that in 2015 23% of all the PCs in the world will use ARM processors. This guess by IHS has since been proved wrong and desktop Windows for ARM has been discontinued. Japanese IT company SoftBank Group Corp., owned by Masayoshi Son, made an agreed offer for ARM on 18 July 2016, at a price of £23.4 billion. If approved, it would be SoftBank's largest overseas acquisition to date, exceeding its acquisition of Sprint in 2013 at a price of US$22 billion. This is a major part of SoftBank's effort to address the IoT market. The United Kingdom withdrawal from the European Union resulted in a fall in the value of the pound, creating an opportunity for SoftBank to acquire ARM at a relatively low price in Japanese Yen. Son, however, explicitly stated that the weakened pound had no impact on his decision to acquire the company. ↑ "ARM's first press release" (PDF). Retrieved 19 November 2015. ↑ Saxby, Robin (23 November 2006). "Chips With Everything" (PDF). Retrieved 27 May 2011. 1 2 3 "Preliminary Results 2015". ARM Holdings. Retrieved 19 March 2016. ↑ "ARM legs it to SoftBank in $32 billion buyout". Ars Technica. Retrieved 18 July 2016. ↑ "Barber Casanovas Ruffles - Chartered Architects: Arm, Peterhouse Technology Park". bcr-architects.co.uk. Retrieved 15 March 2015. ↑ "ARM CPU Core Dominates Mobile Market – Nikkei Electronics Asia – Tech-On!". Techon.nikkeibp.co.jp. Archived from the original on 11 September 2011. Retrieved 18 April 2011. ↑ "ARMv8-R Architecture". arm.com. Retrieved 15 March 2015. ↑ "MSDN Blogs". msdn.com. Microsoft. Retrieved 15 March 2015. ↑ "Multimedia - Graphics Processing from ARM". arm.com. Retrieved 15 March 2015. ↑ Clarke, Peter (26 September 2013). "ARM Closes in on Imagination in GPU Shipments". ↑ "Apple iPhone Update: Whats changed since the iPhone 4". 6 September 2012. ↑ "802.11a/b/g/n MAC/Baseband/Radio with Integrated Bluetooth 4.0+HS & FM Transceiver" (Press release). Retrieved 21 September 2014. ↑ "Single-Chip Bluetooth® Mono Headset IC". Retrieved 21 September 2014. ↑ Klug, Brian (5 June 2012). "ARM: Broadcom Announces BCM4708x and BCM5301x SoCs for 802.11ac routers". Retrieved 21 September 2014. ↑ "Marvell Expands its Broad 4G LTE Product Portfolio with the ARMADA Mobile PXA1088LTE Pro Platform to Support the Issuing of 4G TD-LTE Licenses in China and Operators" (Press release). Retrieved 21 September 2014. ↑ Merritt, Rick. "Cavium Flexes ARM Server Upgrade: 14nm ThunderX2 will pack 54 cores". 1 2 BBC. “ARM chip designer to be bought by Japan's SoftBank 18 July 2016. Retrieved 22 July 2016. 1 2 "SoftBank finally completes £24bn ARM takeover". Silicon Republic. 5 December 2016. Retrieved 5 September 2016. ↑ "ARM Holdings, plc, Company Description – NASDAQ.com". Quotes.nasdaq.com. Retrieved 18 April 2011. ↑ Andrews, Jason (2005). "3 SoC Verification Topics for the ARM Architecture". Co-verification of hardware and software for ARM SoC design. Oxford, UK: Elsevier. p. 69. ISBN 0-7506-7730-9. ARM started as a branch of Acorn Computer in Cambridge, United Kingdom, with the formation of a joint venture between Acorn, Apple and VLSI Technology. A team of twelve employees produced the design of the first ARM microprocessor between 1983 and 1985. ↑ "PALMCHIP Introduces Fully-Integrated, Low-Power Controller Core for OEM Mass Storage Design". EE Times. 16 May 1997. ↑ "ARM Company Milestones". ARM Holdings. ↑ "Advanced RISC Machines Ltd is now ARM Ltd". Findarticles.com. 19 October 1998. Retrieved 18 April 2011. ↑ "ARM wins billion dollar valuation in IPO". Findarticles.com. 20 April 1998. Retrieved 18 April 2011. ↑ "Robin Saxby". The Wall Street Transcript. 26 June 2000. Retrieved 25 September 2013. ↑ "ARM acquires Allant Software". Design-reuse.com. Retrieved 18 April 2011. ↑ Clarke, Peter (10 April 2000). "ARM acquires privately-held design firm". EE Times. Retrieved 1 July 2014. ↑ "Samsung and Incard Launch World's First 32-BitSmart Card for High-Volume SIM Applications". Allbusiness.com. 24 October 2000. Retrieved 18 April 2011. ↑ "ARM buys Noral debug design team". Electronicsweekly.com. Retrieved 18 April 2011. ↑ "ARM buys Adelante's design office, leaves core". Eetimes.eu. Retrieved 18 April 2011. ↑ "ARM Holdings agrees to buy Aachen EDA company". Commsdesign.com. 16 August 2004. Retrieved 18 April 2011. ↑ Coates, Ron. "ARM to buy designer of systems on a chip". News.cnet.com. Retrieved 18 April 2011. ↑ "ARM Purchases Keil Software". Microcontroller.com. Retrieved 18 April 2011. ↑ Smith, Tony (23 June 2006). "ARM buys Falanx". Reghardware.co.uk. Retrieved 18 April 2011. ↑ "ARM acquires SOISIC". Channel-e.biz. Retrieved 18 April 2011. ↑ Peter Clarke, EE Times. "ARM buys processor verification firm Obsidian." 22 June 2011. Retrieved 22 June 2011. ↑ Anton Shilov, XbitLabs. "ARM Acquires Developer of Automated Chip Layout Tools." 1 November 2011. Retrieved 4 November 2011. ↑ "ARM Acquires Internet Of Things Startup Sensinode To Move Beyond Tablets And Phones". TechCrunch. AOL. Retrieved 15 March 2015. ↑ "ARM Acquires Advanced Display Technology from Cadence". arm.com. Retrieved 15 March 2015. ↑ ARM Limited (24 November 2014). "PolarSSL is now a part of ARM". polarssl.org. Retrieved 15 March 2015. ↑ "mbed TLS 1.3.10 released". 8 February 2015. Retrieved 9 February 2015. ↑ "ARM Concludes its Acquisition of Duolog Technologies". ARM. ↑ "ARM Expands IoT Security Capability with Acquisition of Sansa Security - ARM". ARM. 1 2 "ARM Announces Acquisition of Wicentric and Sunrise Micro - ARM". ARM. ↑ "ARM buys Leading IoT Security Company Offspark as it… - ARM". ARM. Retrieved 6 January 2016. ↑ "ARM to Offer Cycle-Accurate Virtual Prototyping for Complex… - ARM". www.arm.com. Retrieved 6 January 2016. ↑ Andrew (18 May 2016). "ARM Acquires Apical – a Global Leader in Imaging and Embedded Computer Vision". Apical. Retrieved 20 July 2016. ↑ "Product Backgrounder" (PDF). ARM Holdings. January 2005. Archived from the original (PDF) on 3 December 2007. ↑ "What processor does the iPod, iPod mini, iPod nano, iPod touch, and iPod shuffle use?". Everymac.com. Retrieved 18 April 2011. ↑ "ARM powered products" (Press release). ARM Holdings. Retrieved 18 April 2011. ↑ "Sony PlayStation Portable – PSP" (Press release). ARM Holdings. Retrieved 18 April 2011. ↑ "Processor Licensees". arm.com. Retrieved 15 March 2015. ↑ "ARM Sets New Standard for the Premium Mobile Experience". ARM Holdings. Retrieved 21 October 2016. ↑ "Licensing ARM IP". ARM Holdings. Retrieved 20 September 2013. 1 2 3 4 5 Shimpi, Anand Lal (28 June 2013). "The ARM Diaries, Part 1: How ARM's Business Model Works". Anandtech. p. 3. Retrieved 21 September 2013. ↑ Lai Shimpi, Anand (10 September 2013). "Apple Announces A7, World's First 64-bit Smartphone SoC". AnandTech. Retrieved 16 September 2013. ↑ Whitwam, Ryan (26 August 2011). "How Qualcomm's Snapdragon ARM chips are unique". Retrieved 19 September 2013. 1 2 3 4 5 6 7 ARM, "ARM Launches Cortex-A50 Series, the World’s Most Energy-Efficient 64-bit Processors." Retrieved 30 October 2012. ↑ "AppliedMicro Showcases World's First 64-bit ARM v8 Core". AppliedMicro. 27 October 2011. Retrieved 18 September 2013. 1 2 3 "ROCKCHIP EXTENDS PARTNERSHIP WITH ARM BY SUBSCRIPTION LICENSE OF ARM PROCESSOR AND GPU TECHNOLOGIES" (Press release). ARM Holdings. 5 November 2013. Retrieved 8 November 2013. ↑ "AMD Strengthens Security Solutions through Technology Partnership with ARM" (Press release). 13 June 2013. Retrieved 19 September 2013. ↑ "Advanced Low-Cost HSPA/EDGE Multimedia Baseband Processor - BCM21654". Broadcom. Retrieved 19 September 2013. ↑ "i.MX Applications Processors". Freescale. Retrieved 19 September 2013. ↑ "Vybrid Controller Solutions based on ARM® Technology". Freescale. Retrieved 19 September 2013. ↑ Merritt, Rick (26 February 2012). "Huawei claims quad-core chip outguns Tegra3". ↑ "IBM and ARM to Collaborate on Advanced Semiconductor Technology for Mobile Electronics" (Press release). 17 January 2011. ↑ "32-bit Industrial Microcontrollers based on ARM® Cortex™-M". ↑ Savov, Vlad (26 April 2011). "LG licenses ARM Cortex-A15 and Mali-T604 graphics, starts scheming up mobile processors of its own". Engadget. Retrieved 19 September 2013. ↑ "LG Electronics Becomes Lead Partner For ARM Cortex-A50 Family Of Products And Next-Generation Mali GPUs" (Press release). 23 May 2013. Retrieved 19 September 2013. ↑ "SoC FPGAs | FPGA & SoC | Products". www.microsemi.com. Retrieved 2016-09-19. ↑ "Microcontrollers :: NXP Semiconductors". NXP Semiconductors. Retrieved 19 September 2013. ↑ "R-Car M1A/S". Renesas. Retrieved 19 September 2013. ↑ "Samsung announce 1GHz ARM CORTEX-A8 Hummingbird CPU". GSMArena. 27 July 2009. Retrieved 19 September 2013. ↑ "Samsung Exynos 5 Dual". Samsung. Retrieved 19 September 2013. ↑ "STM32 32-bit ARM Cortex MCUs". STMicroelectronics. Retrieved 19 September 2013. ↑ "ARM-Based Processor Platforms". Texas Instruments. Retrieved 20 December 2015. ↑ Fergie (31 October 2012). "ARM Cortex-A50: Broadening Applicability of ARM Technology in Servers". ARM (Community portal). Retrieved 16 September 2014. : "Applied Micro announced their intent to develop a 64-bit ARM powered server device. ARM demands compatibility between companies that develop their own ARM processors (achieved through an architecture license) ... three publicly announced ARMv8 architecture licensees (Applied Micro, Cavium and NVIDIA)"
↑ Clarke, Peter (1 November 2013). "London Calling: Are ARM's core days numbered?". EETimes. Retrieved 16 September 2014. : "the number of architectural licenses seems to have increased with Applied Micro and Cavium"
1 2 ARM and Broadcom Extend Relationship with ARMv7 and ARMv8 Architecture Licenses. Business Wire (8 January 2013). Retrieved on 2 August 2013. ↑ "ARM and Cavium Extend Relationship with ARMv8 Architecture License" (Press release). 1 August 2012. ↑ "Huawei announces global agreement to licence ARMv8 architecture" (Press release). 4 September 2013. Retrieved 19 September 2013. ↑ "NVIDIA Announces "Project Denver" To Build Custom CPU Cores Based On ARM Architecture, Targeting Personal Computers To Supercomputers" (Press release). 5 January 2011. Retrieved 19 September 2013. ↑ "NVIDIA Charts Its Own Path to ARMv8" (PDF). Tirias. 11 August 2014. p. 1. Retrieved 16 September 2014. : "NVIDIA announced back in 2011 that it had taken an architecture license for the 64-bit ARMv8 instruction set and was building a custom ARM core. The result is Project Denver. " ↑ "AMD Unveils Ambidextrous Computing Roadmap. Announces 64-bit ARM Core Architecture License and Future "K12" ARM-based Core.". SAN FRANCISCO, CA: AMD Press-release. 5 May 2014. Retrieved 16 September 2014. ↑ Merritt, Rick (5 May 2014). "AMD Takes Swing at Custom ARM First up, pin-compatible ARM, x86 SoCs". SAN FRANCISCO: EETimes. Retrieved 16 September 2014. ↑ "Samsung to Jump up Its Application Processor Competitiveness". etnews. 29 July 2013. Retrieved 16 September 2014. :"It is known that Samsung signed an architecture license with ARM two to three years ago ... also 64bit ARMv8 architecture is included in the contract." ↑ "Faraday Technology Corporation - ARM Cores". ↑ "HDD Markets and Technologies". Retrieved 19 September 2013. As one of a few select companies to hold a full ARM architecture license, Marvell is uniquely positioned to leverage the pervasiveness of the ARM architecture. ↑ Clarke, Peter (23 July 2010). "Microsoft takes ARM architectural license". Retrieved 19 September 2013. ↑ "Qualcomm's New Snapdragon S4: MSM8960 & Krait Architecture Explored". AnandTech. 7 October 2011. Retrieved 16 September 2014. : "Qualcomm has an ARM architecture license enabling it to build its own custom micro architectures that implement the ARM instruction set." ↑ Gwennap, Linley (19 July 2010). "TWO-HEADED SNAPDRAGON TAKES FLIGHT" (PDF). Microprocessor Report. Retrieved 16 September 2014. : "The Scorpion CPU implements the ARMv7-A instruction set, ... under an architecture license from ARM." ↑ "Intel adopts power conscious strategy to counter ARM". TGDaily. 17 May 2011. Retrieved 16 September 2014. : Intel CEO Paul Otellini, "we have an ARM architecture license. we have no intention to use [it] again to build chip." ↑ Morgan, Timothy Prickett. "Inside Japan's Future Exascale ARM Supecomputer". The Next Platform. Retrieved 13 July 2016. ↑ "Allwinner A33 Processor Goes Official, Cortex-A7 Quad-core And Mali-400 MP2 GPU". GSM Insider. Retrieved 5 June 2014. ↑ Timothy Prickett Morgan, The Register. "ARM Holdings eager for PC and server expansion Record 2010, looking for Intel killer 2020." 1 February 2011. Retrieved 21 September 2011. ↑ Shimpi, Anand Lal (31 March 2014). "ARM Partners Ship 50 Billion Chips Since 1991 - Where Did They Go?". AnandTech. Retrieved 16 September 2014. ↑ Ashok Bindra, TMCnet. "ARM, Windows 8 to Power Future Notebooks, says IHS." 28 July 2011. Retrieved 2 August 2011. ↑ Dell, "Copper enables the ARM server ecosystem." Retrieved 9 January 2013. ↑ Martyn Williams, IDG News. "ARM Expects Half of Mobile PC Market by 2015." 29 May 2011. Retrieved 18 July 2011. ↑ "ARM Holdings - Investor Relations - ARM Holdings plc - Financial Reports - annual reports". arm.com. Retrieved 15 March 2015. ↑ "HEXUS.net - ARM Everywhere". hexus.net. Retrieved 15 March 2015. ↑ "Share Sleuth: tech titan ARM on sale". Money Observer. 23 February 2016. Retrieved 19 March 2016. ↑ Peter Clarke, EE Times. "ARM extends Michigan research deal." 31 August 2011. Retrieved 20 September 2011. ↑ Chris Edwards, Electronics Weekly. "ARM extends Michigan low-power work." 31 August 2011. Retrieved 20 September 2011. ↑ "Warren East: Executive Profile & Biography". BusinessWeek. Bloomberg. Retrieved 21 March 2012. ↑ "Warren East profile". Forbes. Retrieved 23 August 2009. ↑ "ARM CEO Warren East steps down". PC Pro. Retrieved 19 March 2013. ↑ "Appointment Of New Chairman". ARM Investor Relations. ARM Investor Relations. Retrieved 12 March 2014. ↑ By Ric Carew, Eva Dou and Stu Woo, The Wall Street Journal. “SoftBank to Buy ARM Holdings for $32 Billion.” 18 July 2016. Retrieved 22 July 2016. ↑ "Sprint and SoftBank Announce Completion of Merger". Retrieved 18 July 2016. ↑ "ARM chip designer to be bought by Japan's Softbank". BBC News. 18 July 2016. Retrieved 18 July 2016. ↑ Hammond, Ed; Sherman, Alex; Ramli, David (17 July 2016). "SoftBank Said Near $32 Billion Deal for Mobile Chip Leader ARM". Bloomberg. Retrieved 18 July 2016. ↑ Smith, Jake (18 July 2016). "SoftBank to acquire Arm Holdings for £23.4 billion: Report". ZDNet. Retrieved 18 July 2016.